Clicking the above button will take you to this product listing on Human Solution's website, our ergonomic superstore. There, you will be able to buy this item and more. Clicking the above button will take you to this product listing on UPLIFT Desk's website. There, you will be able to buy this item and more. The UPLIFT Large Keyboard Tray offers a range of features and adjustments so you can type in a comfortable and ergonomic position. The large platform has plenty of surface area for both your keyboard and your mouse. The combination mouse pad/cord manager can easily move from one side of the board to the other for ambidextrous mousing, and a removable palm support helps to keep your wrists straight while typing. 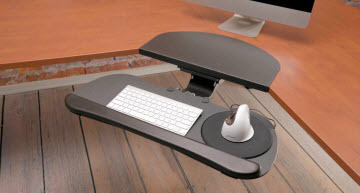 The UPLIFT Corner Sleeve will allow you to easily mount your tray in the corner of an L-shaped desk. This corner sleeve is available in two different models, to accommodate desktops anywhere from 1'' to 2.5'' thick, and can be installed with any UPLIFT keyboard tray track. Designed specifically with individual fit in mind, the Goldtouch Adjustable Comfort Keyboard will find the right fit comfort position for every member of your office or home. While supplies last, add a brand-new keyboard to complement your keyboard tray at a special low price of just $20. The UPLIFT Track Spacer allows you to mount your keyboard tray track over the crossbars under your desk, giving you more flexibility in positioning accessories, especially on smaller desks. If your desk is only 24 inches deep, this will allow you to place the 22" track over the crossbars so you can stow the keyboard tray completely underneath the desk. A keyboard tray allows you to place your keyboard in the most comfortable ergonomic position, so that you are not reaching, straining, or placing your arms at a painful angle. It lets you bring the keyboard closer to your body, moving it as you switch positions. Using a keyboard tray prevents and alleviates repetitive stress injuries caused by typing and mousing. What adjustments can I make with this tray? The tray raises, lowers, pivots, and tilts. Negative tilt keeps your wrists in a neutral position as opposed to the bent position found with most keyboards. You should never use the flips found on the rear of many keyboards, as that creates a positive tilt that forces your wrists to bend. I have a very large keyboard. Will it fit on the tray? The tray platform is 27" wide and 11 1/8" deep, which accommodates almost all keyboards. If you have a deep keyboard, or one with an integrated wrist rest, you can remove the wrist rest included with the tray, which will give you extra room on the platform. How much space do I need underneath my desk to mount the track? The tray comes with two tracks. Use the 21" track if you have enough room, which will allow you to push the tray back for storage under the desk when not in use. You can use the 11" track if you have limited space under your desk. To store the tray, push it back as far as it will go and rotate it on the mechanism. I have a lip on the edge of my desk. Can I use this tray? It depends on the size of the lip. If 1" or less, you can use keyboard tray spacers in order to mount the track and mechanism. Can I use this tray on a glass/granite/steel desktop? No. Mounting the track requires drilling into the desktop. The tray platform is 19 3/4" wide and 12" deep, which accommodates almost all keyboards. If you have a deep keyboard, or one with an integrated wrist rest, you can remove the wrist rest included with the tray, which will give you extra room on the platform. Can I use this tray on a thin desktop? The mounting screws are 5/8" long; we recommend using the tray on desktops at least 1" thick. I'm assembling my tray, but the height is not adjusting. What do I do? Make sure the tray platform is attached to the mechanism. The height adjustment will not work until the tray is attached. Also, check that you have removed the shipping pin as described in Step Four of the assembly instructions.